(Trent Nelson | The Salt Lake Tribune) The Sears store at 800 S. and State Street in Salt Lake City, Friday November 3, 2017. The company will close the location in January 2018. Early Monday morning, Sears announced it had filed for Chapter 11 bankruptcy — which would allow it to reorganize and possibly reemerge from bankruptcy with some part of the business intact — and received commitments for $300 million in debtor-in-possession financing to carry through the bankruptcy period while it restructures its debt and reorganizes its business. The company is negotiating an additional $300 million in financing from ESL Investments, a hedge fund run by Sears' former chief executive, Eddie Lampert. 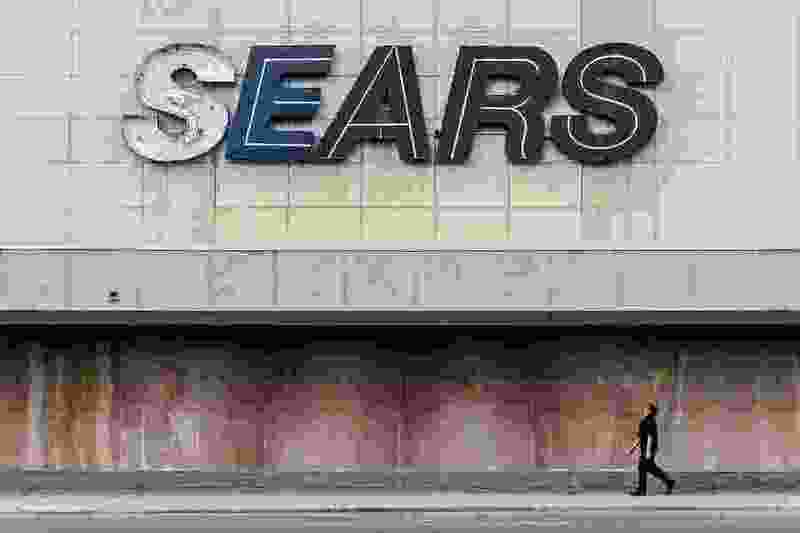 ESL Investments is also Sears' largest stockholder and creditor. "The intention is to bring the company out on the other side," a person familiar with the negotiationstold The Post on Friday. The stock price was 41 cents a share in pre-market trading Monday morning — up from Friday’s closing price of 34 cents. As part of the transition, Sears will also undergo a series of leadership and board changes. Eddie Lampert has stepped down from his role as chief executive and will remain chairman of the board. The company created an Office of the Chief Executive — responsible for day-to-day operations — that will be filled by three officers. The company has also formed a committee to oversee the restructuring process. "As we look toward the holiday season, Sears and Kmart stores remain open for business and our dedicated associates look forward to serving our members and customers," Lampert said in a statement. Lampert's hedge fund, ESL Investments, said it had consistently believed that restructuring the company's finances could have been best achieved outside a court-run bankruptcy process. In April and August, ESL presented proposals to acquire certain Sears assets, followed by a broader September plan for real estate transactions and asset sales. "ESL believes that supervision by a judge will enable creditors to address any issue among them according to a clear set of rules and permit the sale of certain assets through a court-approved auction process to maximize value," the fund said in a statement. The 125-year-old retailer was hardly the first to crumble while saddled with cavernous showrooms as e-commerce competitors soared. The company has roughly $5.6 billion in outstanding debt and has dwindled down to about 820 Sears and Kmart stores, down from 2,000 five years ago. It has also already sold off many of its brands, including Craftsman tools, and hasn't turned a profit since 2010. Many of its most valuable properties have been sold off, with the other half leased and offering little cost savings from rent restructurings since Sears already pays below market rents. One bankruptcy expert described Sears' downfall as "the slowest-moving train wreck." But any movement toward bankruptcy seemed to gain momentum last week with reports that Sears had hired New-York based M-III Partners to prepare the filing. Sears recently added a restructuring expert as a company director for an additional layer of guidance on how to navigate a bankruptcy filing. In September, Lampert — Sears' largest shareholder and creditor and the owner of the hedge-fund ESL Investments — asked creditors to refinance $1.1 billion in debt before the Oct. 15 payment, according to a filing with the Securities and Exchange Commission. He also called on the company to sell off $3.25 billion in real estate and assets. Those include Sears Home Services and the company’s flagship Kenmore brand, which Lampert offered to buy in August for $400 million. Lampert has often attempted to keep Sears viable with loans. Much of his focus has turned to Sears' online presence over upkeep on physical storefronts, many of which total thousands of square feet. Lampert bought Sears in 2004 and merged it with Kmart, in which he had a controlling stake, the next year. Lampert himself has had a controversial tenure at Sears. Paula Rosenblum, co-founder of Retail Systems Research, wrote in Forbes that Lampert would emerge from a Sears bankruptcy as the least-sympathetic victim and perhaps the largest beneficiary. Lampert learned long ago that he could make money from from selling off some of the company's signature brands, like Craftsman tools and Lands End. Plus, in bankruptcy proceedings, the largest creditors become the owners of the new entity. Rosenblum told The Post that those with the most to lose from Sears' end will be the workers who stand to lose their pensions and jobs. And malls and shopping centers — ultimately left with huge empty warehouses — will have to get creative about new ways to clinch foot traffic. Options could range from food halls to pop-up stores to Tonya-Harding-esq skating rinks, Rosenblum said — so long as the concept was about more than just shopping. Still, even given Lampert's mismanagement and Sears' drawn-on decline, Rosenblum distilled the company's downfall to one word: tragedy.